The winter term for Olli (Osher Life Learning Institute) at Furman University has just ended this week. And I forgot to post a picture of Clementine Daisy which was included in the "Pretty Posies" exhibit in Baiden Gallery of the Herring Center for Continuing Education. Clementine Daisy was the only quilt included in the exhibit and since it is small, just 21" x 21", it fit right in among other mediums like watercolors, drawings, photography and mosaics. 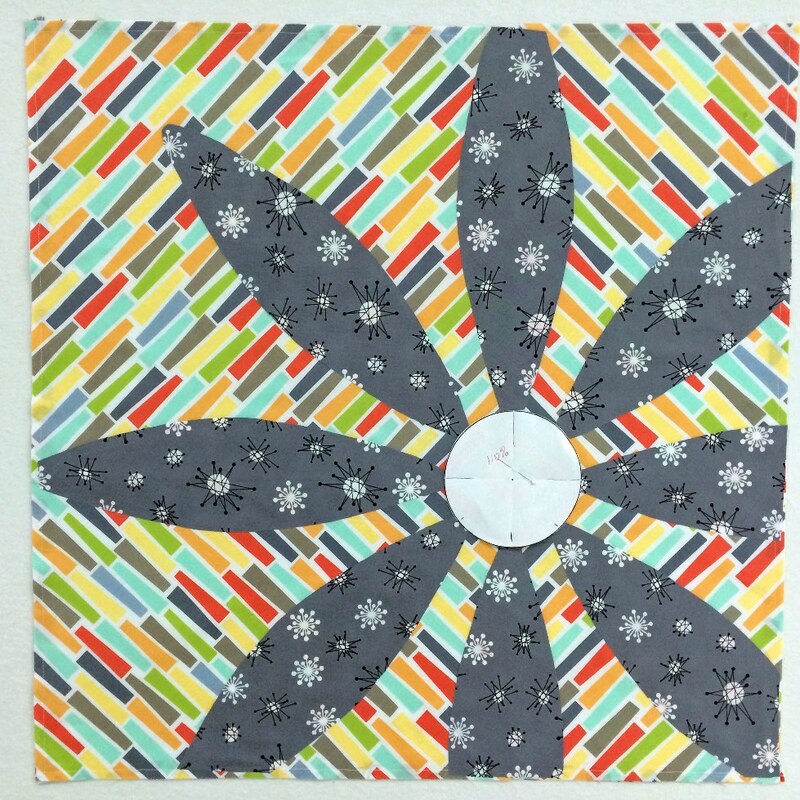 Clementine Daisy was made for the MQG Michael Miller Fabric Challenge in July 2014. 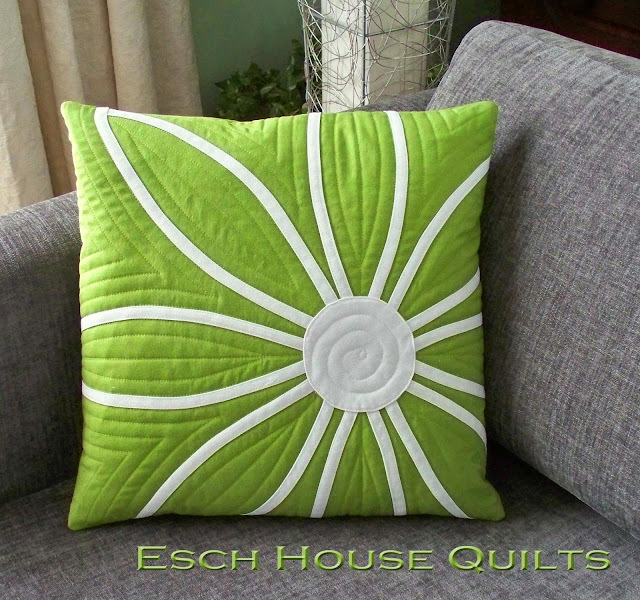 The fabric collection was Petal Pinwheels. (The winners of the challenge are here.) 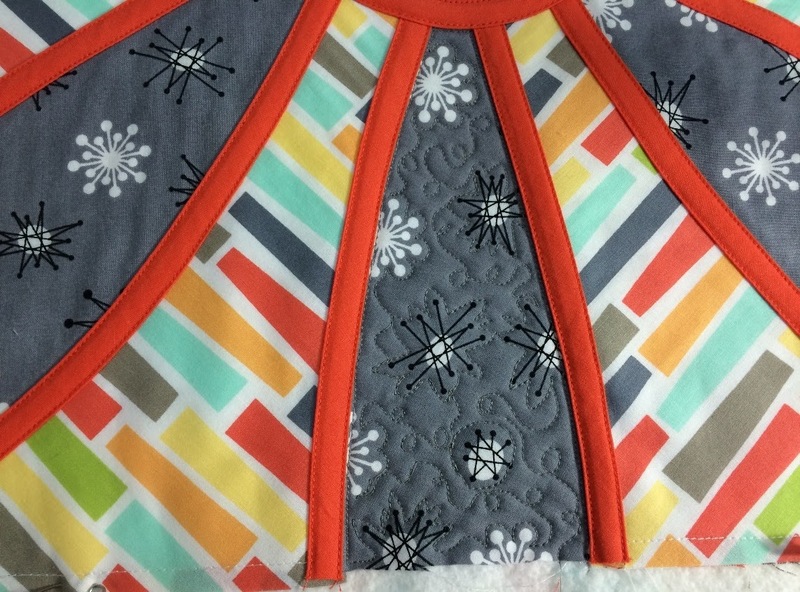 I followed a tutorial by Debbie Grifka, Sew Solid Sunday #4, and loved working with the bias applique. This is Debbie's version made with Kona solids. I found a few in-process photos. This little wall hanging is all about BIAS. Here the background has been pieced on the bias and the petals are cut and in place. I must have enlarged Debbie's templates by 110% because it says so. The petals are outlined in bias stems which were fused in place and then topstitched on each edge with a straight stitching. This must have been the first petal I quilted. 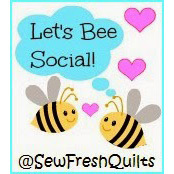 I remember not knowing what to quilt where, but that's usually how I feel about every quilt. 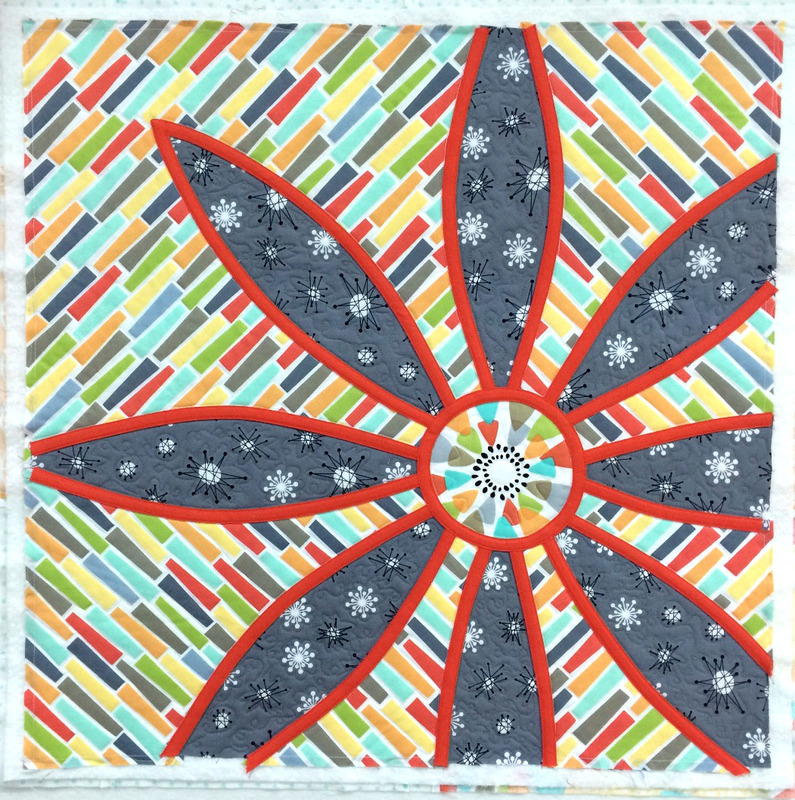 Clementine Daisy after the quilting is complete. Not only were the petals outlined in bias, the center was also outlined in bias. It was really a guessing game to sew bias circle together and then audition to see if it covered the center without being too large or too small. It had to be just right and it worked! :) And guess what, the binding was also cut on the bias. Update: I added a circle over the photo so you could see where the bias strip is joined to make the circle. I measured the circumference of where I wanted the circle to be, added 1/2" for the seam allowance and cut the bias strip to that length. The join is also with a diagonal seam. So with a little math and a lot of luck it all worked out. I added the bias around the daisy center rather than a solid because I wanted to showcase one of the prints in the collection. 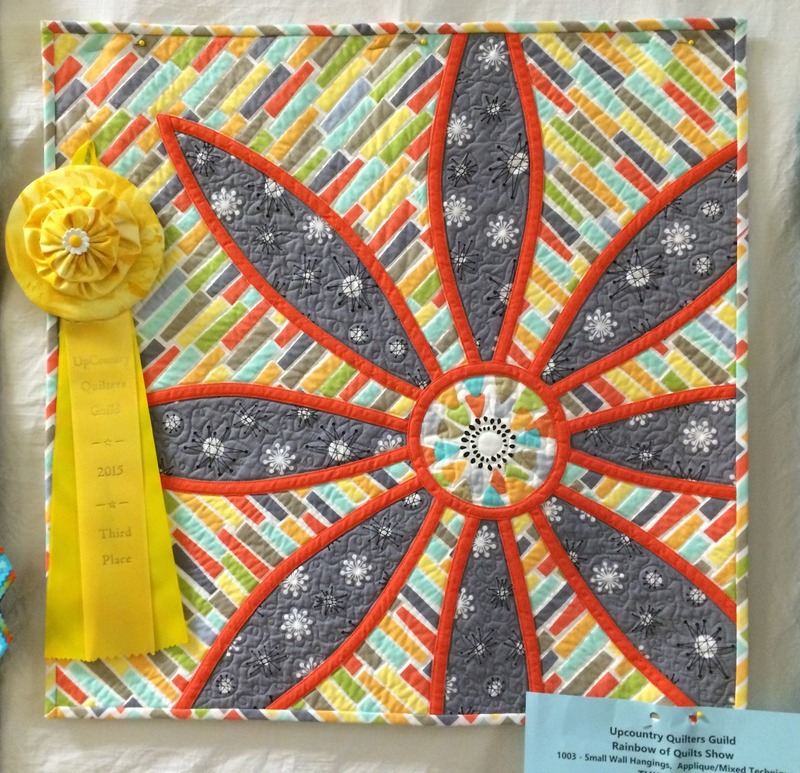 I even got 3rd place in our guild's show in the applique/mixed technique category. I remember being up against some stiff competition, so I was thrilled! Edging the centre circle with bias, very tricky. The whole wee quilt is so pretty. Continuing education, what a great place, I looked at all those courses to choose from, as a senior, I try and learn something each week, and this week again it was Geography. Place names, and which state is next to another. I honestly don't understand the center bias circle... is there a seam there at all? What magic is this?! It looks great hanging in the collection, congratulations! Paige this looks great on the wall. I really like what you did with the background fabric. What a cute piece! Very striking and happy and perfectly sewn. Your work is just so precise! That's some graduate-level bias tape work, Paige! What a super little piece! Congratulations on your ribbon. I love that your quilt was shown among a group of other mediums. How did you get it into the exhibit? Do you work at Furman? It's apparent that your bias tape technique worked beautifully! I enjoy working with bias tape, though I haven't done so since the QuiltCon 2015 Bias Tape Challenge. Thanks for sharing your process of making this piece. It sure is lovely! What a beautiful piece and it looks very much at home hung amongst the paintings, well done you! Hello Paige. Congratulations on the Ribbons. Plus, how exciting honor to be hung in an exhibit. Your sharing the details of the making of this spectacular piece was thoroughly enjoyed by me and I am very impressed. 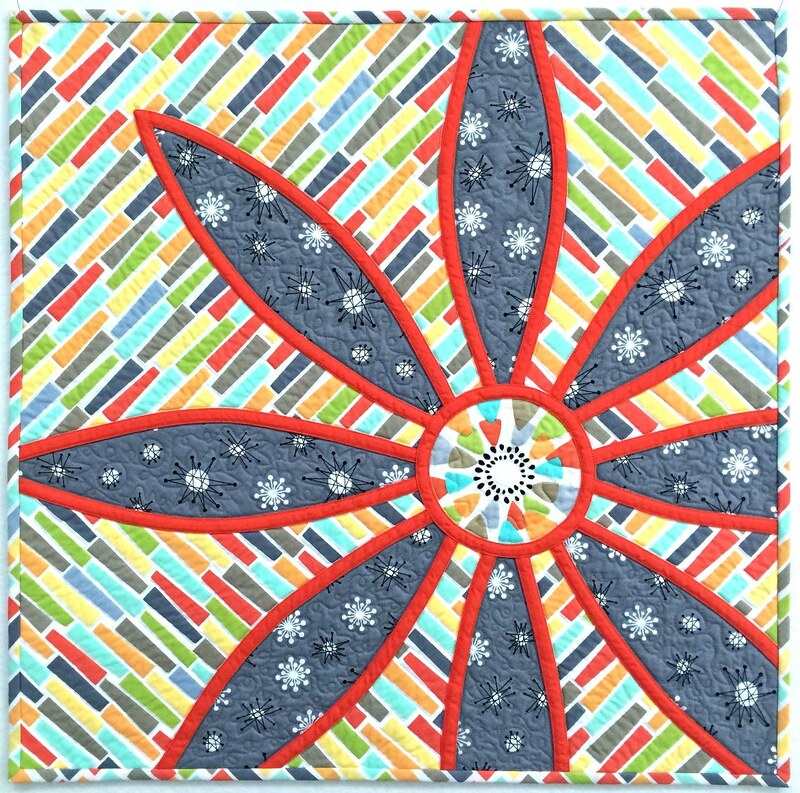 Thank you so much for sharing this important piece of your life and quilting journey. Have a great day! Wow ! Great job Paige, as always ... So cool that your quilt was included in this exhibit. Beautiful! I love how you take on a challenge and make EVERY bit follow your goal. The bias here, the 9 patch in the previous post. 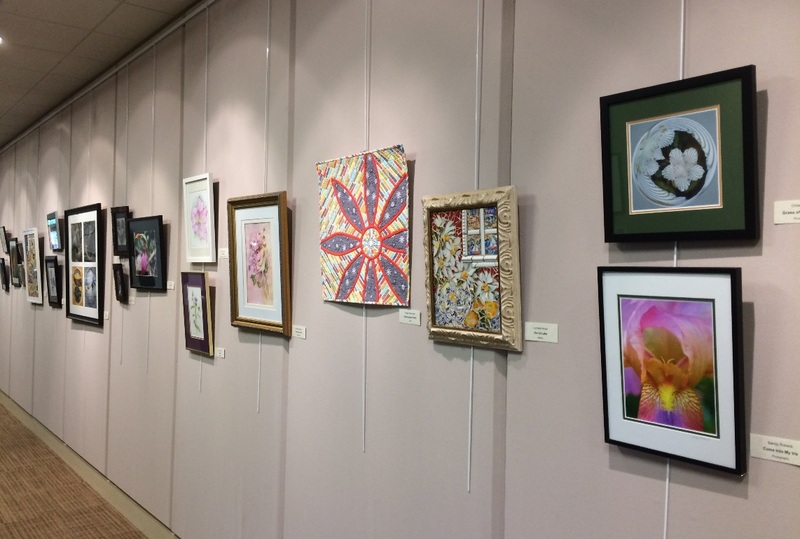 I also love how the quilt looks hanging with all the other art - a fresh and modern standout! Well done! What a great piece Paige! I had a close look at your circled section and I could just see the seam - brilliant workmanship. Sometimes we have art/craft displays at work - next time I know what to make! Love this quilt! I recently watched a video on this technique. That video and your post are pushing me towards giving this a try! It's so pretty! I love your version, and how different it looks from the original. And I love how at home it looks on a gallery wall with art in other mediums. 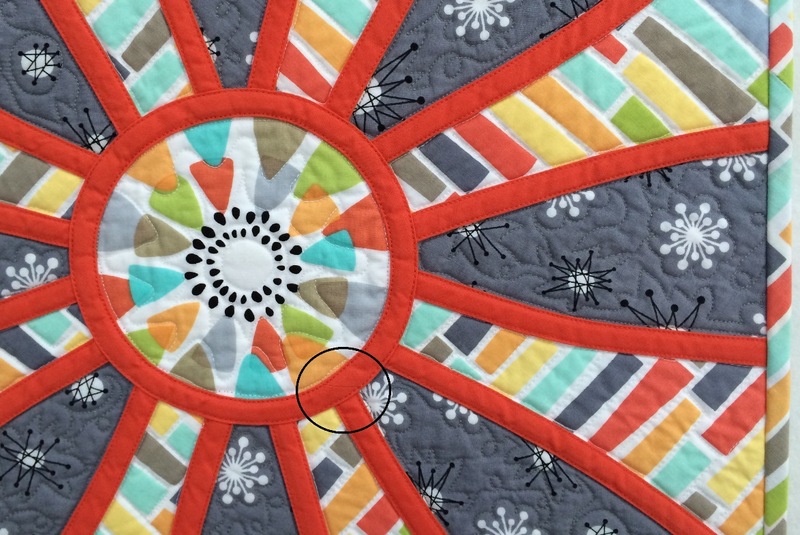 I like this quilt Paige - and the info of using the binding. I have a couple of quilts in my head that I would like to try this method with but have, as yet, had the time to get them off the ground. Like you I am never sure what to quilt where to begin with so I just have to load up my quilts and make that first stitch!! That clementine daisy is just gorgeous! So great that it's recognized as the beautiful artwork it is.